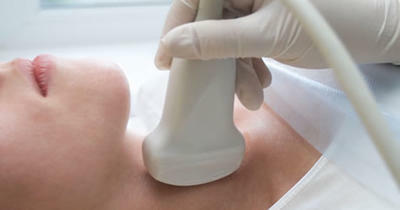 The carotid artery is usually visualised first using an ultrasound to the neck. The scan is the same sort used to visualise a baby in the womb and is quick and painless. The ultrasound scan gives a grey scale image of the vessel, and the disease if present. It is used to measure how fast the flow is through the diseased portion of the vessel. These measurements provide vital information about the risk of stroke from the carotid artery. Sometimes another type of scan is used, an MRI or CT scan. These are sometimes used in addition to confirm the result if findings are not completely clear on ultrasouns, and also to visualise the brain if required. Both MRI and CT scans are also painless, although usually there is the need to inject a solution into the blood to make blood flow easier to see. Once the carotid artery has been imaged, your specialist will be able to advise you on which treatment is best for your individual circumstances. For some it will be medicine, others surgery or stent insertion, and for some it will be all clear. The first treatment, whether the carotid artery is diseased or not, will be "Best medical therapy". this is standard medical therapy using tablet medication to prevent clots from forming, an 'antiplatelet agent', and to prevent deterioration in the condition of the artery, a 'statin'. There may be the need to provide other treatment too for blood pressure or irregular heart rhythm, for example. Surgery is the gold standard treatment for symptomatic, and some asymptomatic, carotid artery disease. The operation is called Carotid Endarterectomy. The disease (plaque) is removed through an incision made in the neck and then the artery. The artery is sutured closed again to restore normal blood flow to the brain (see the illustration right). Surgery has its risks but in expert hands of vascular specialists these are minimised, and the vast majority of patients reduce their risk of further stroke significantly. In most circumstances the procedure can be performed with the patient awake using only injected local anaesthetic. Sometimes it is performed with the patient asleep. The recovery from the procedure is rapid. The patient is allowed home the following day and the wound heals within weeks. It is recommended that medical treatment continues afterwards. 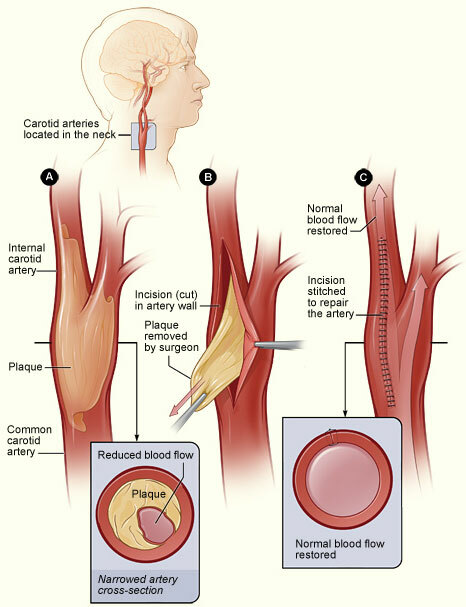 Inserting a stent into the diseased carotid artery is used less commonly as a form of treatment. It has been used for several years now and has some advantages in terms of fewer wounds, less pain, and being minimally invasive. 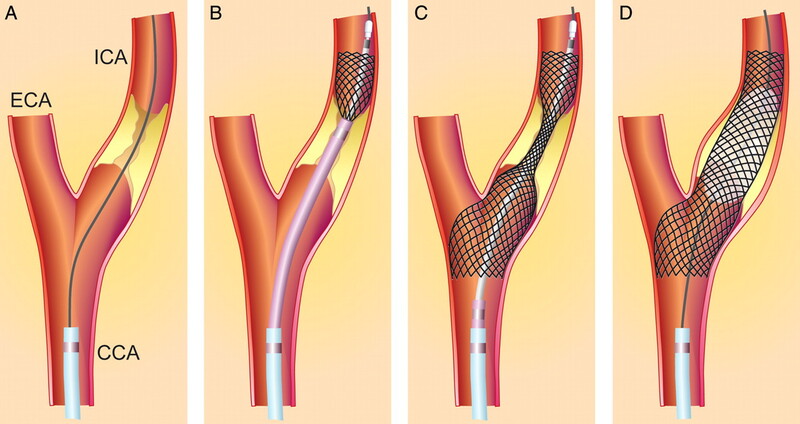 However there are some significant drawbacks with stent deployment because there is an increase risk of causing a stroke during the procedure than with surgery. At the moment the technology isn't quite as good as surgery in terms of complications over all so as a treatment it is reserved for those for whom surgery is not an option or for those for whom surgery represents more of a risk than stent. Your Specialist Vascular Surgeon will be able to guide you with assessment of the pros and cons of surgery vs stent.